Holistic treatment includes methods that support whole-person wellness. A variety of approaches means you gain more individualized treatment for better results. One such approach includes letting your beloved pet live with you in rehab. Pet friendly rehab provides many benefits for healing. Pets help you heal from a wide variety of conditions. These include many symptoms and effects of mental illness. Pets aid healing from depression, PTSD, and anxiety. Having your much-loved pet with you in treatment even makes your treatment experience more positive. Depression causes low mood, high blood pressure, social isolation, and other effects. However, having your pet around boosts dopamine levels in your brain, which are your brain’s own pleasure chemicals. This boosts your mood while also lowering your blood pressure. Having a pet also keeps you more engaged with other people, as a natural cause for interaction with those around you. Post-traumatic stress disorder, PTSD, comes from experiencing extreme trauma from combat, disasters, or abuse. Many people with PTSD find comfort in training their animals. They also gain relaxation and social interaction when taking their pet outdoors or among other people. For anxiety, pets ease overwhelming feelings and intense focus on problems. Simply petting your animal relaxes you, giving you a break from things that upset or worry you. Pets provide other benefits, too. 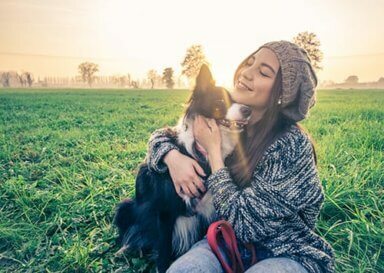 They increase your activity level, improve your food intake and weight, and give you a greater feeling of “home.” Pets provide great conversation openings and give you common interests for interacting with others naturally. Being in a pet friendly rehab program means having your best friend with you throughout treatment. Both you and your pet benefit from staying together. During treatment, you don’t have to worry about your pet’s well-being or if someone is taking care of them properly. You have a strong sense of being at “home” when your pet stays with you during this important time of your life. As previously said, multiple mental conditions benefit from pet interaction. Symptoms of depression, anxiety, and PTSD all improve when you have a pet to care for. These mental conditions often exist with substance abuse and addiction. Being in pet friendly treatment keeps your focus on positive time with your animal and off of cravings or other side effects of withdrawal. You have other responsibilities in caring for your pet, and they need your attention. This means you naturally do things that take your mind off how you feel and symptoms you experience. Time with your pet also boosts your dopamine levels, causing a pleasure response in your brain. These pleasure chemicals mimic some of your drug response. You gain these positive benefits without negative side effects of substance abuse. Additionally, your pet gives you the unconditional, non-judgmental love you need. This support enables safe physical touch, without anxiety associated with past abuse. With your pet, you also easily start conversations and get to know people around you. This helps you interact with peers in pet friendly rehab while keeping you calm and positive. With your best friend by your side in pet friendly rehab, you struggle less with thoughts of abandoning rehab. You’re more likely to stay the course, knowing you don’t stand alone and that you have the quiet support and love you need. In Orange County, you gain the treatment you need for strong sobriety and a real chance at a better life. Call Morningside Recovery now at 855-416-8202 to learn more about the available pet friendly rehab programs.